Granola was never part of my breakfast as a child. In France, we eat tartines in the morning, slices of bread with a (thick) layer of jam, or croissants and viennoiseries. After moving to Finland, layers of cheese, salami and cucumber appeared on my morning bread (see how you can get used to anything). Granola is a recent addition to my breakfast, after I got totally addicted to its crunchiness during my holiday in California last summer. Have you noticed how commercial gluten free granola often lacks flavor, contains refined sugar and not so healthy oil like palm oil? I did. When you think that after all, granola is a simple mix of oat, nuts, seeds and dry fruits, coated with a little oil and sweetener, it can’t be that hard to do yourself the healthy way, can it? So couple of weeks ago, I prepared my first batch of fresh granola and it was soooo easy! Probably the most difficult part was to pick the flavors to toss in it. I admit I run a bit too wild adding every nuts, seeds and dry fruits I had in my cupboards. Few tries later, I came up with a perfect granola blend, I can’t wait to share with you today. This granola is like summer in a bowl with sunny apricots, coconut flakes, dates and vanilla flavors. I got inspired by the amazingly warm weather we enjoy in Finland so early in the season (really unusual in May!). This recipe is packed with healthy fat, seeds and nuts, and naturally sweetened with organic Finnish honey, only good-for-you ingredients! I usually cannot wait and start digging into the warm granola freshly out from the oven, enjoying how it makes the whole house smell like heaven. 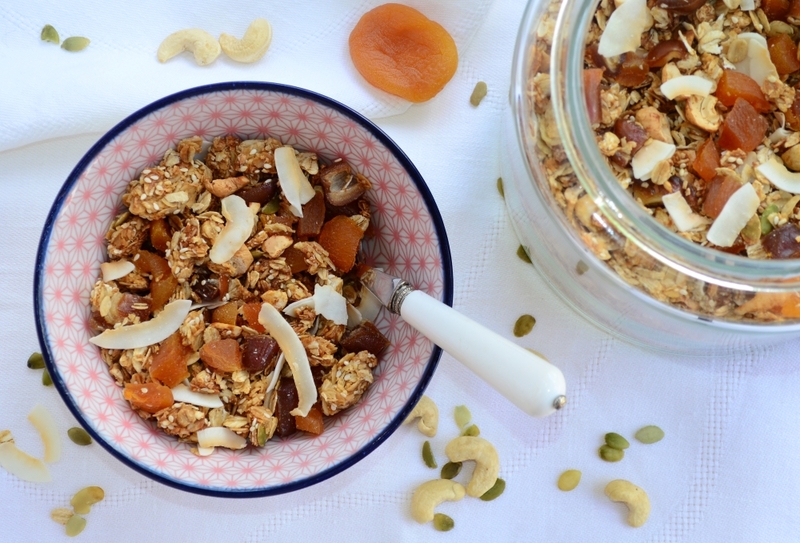 Summer in a bowl with this gluten free granola! Sunny apricots, coconut flakes, dates and vanilla flavor, naturally sweetened with organic honey. Preheat oven to 150 degrees. Line a rimmed baking sheet with unbleached parchment paper. Combine oat, seeds, nuts, shredded coconut and salt in a large bowl. Place the honey, oil and vanilla in a small bowl and stir to combine. Pour over the oat mixture and mix until the oats are thoroughly coated. Spread on the baking sheet and cook in the oven for about 30 minutes. Give it a stir halfway. 10 minutes before the end, add the chopped apricots and dates. When the granola looks toasty brown, take it out from the oven and add the coconut flakes. Leave the granola to cool down on the pan without stirring it, that's when it gets crunchy. Store in an airtight glass jar in refrigerator.